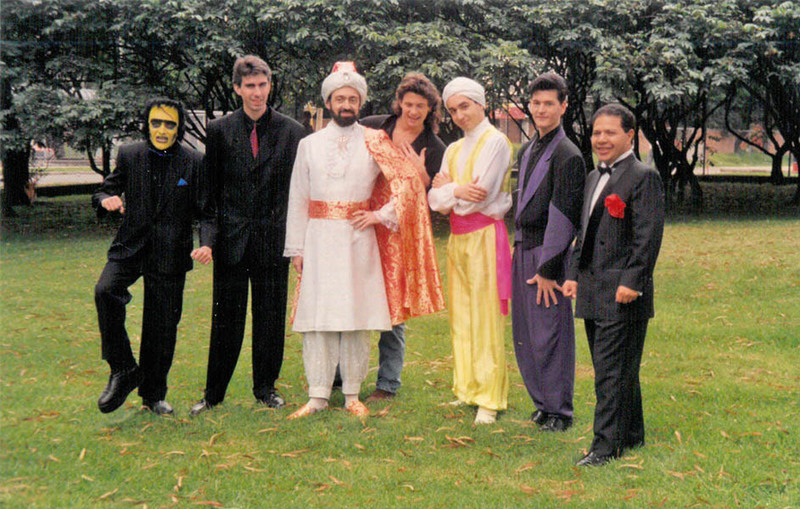 Bogota, national theater La Castellana, 1994, with : Greg Frewin from Canada, Christopher Hart from USA, Enric Magoo from Spain, Merpin from Argentina, Gustavo Lorgia from Colombia, Omar Pasha from France. “El Mundial de Magia” (The World Festival of Magic) is a Tour in Bogota, Medellin, Cali, Pereira, Jopal, organised by the Colombian illusionist Gustavo Lorgia, a star in his country, through many TV shows. The theatres are packed. Audiences are very lively, reactive and enthusiastic. See also our impressions and stories about Medellin, Cali, Pereira, Jopal. Knowing the rules of a city, that is what is essential here. We are immediately warned to watch out for our personal safety, to merge into the crowd, to avoid carrying any handbags, jewels or cameras. So many contrasts : luxurious shopping centres, groups of houses secured by armed guards with dogs. At the time of the shows, the theatre is surrounded by a military cordon. Our audience, including families with children, nicely dressed up, agrees to the checking of their belongings. And yet, everybody lives, breathes and enjoys themselves. Another side is the visible poverty, the street children : the “gamines” who light fires in the streets or under the bridges to warm themselves. Bogota is elevated : 2700 meters (8858 feet), the nights are cold. Outstanding visits at the “Gold Museum” and at Simon Bolivar’s House. The World Theatre Biennial Festival is a huge success. Also, good memories with artists and organizers of the Biennial, and with friends and friends of Colombians friends : ever going chats, Caribbean music which takes you out of your seat and makes you dance. Also, many friendly encounters with Colombian magicians. Omar Pasha from France, the event at the National Theatre.